It’s another Friday! What a week… I’ve decided what this blog needs is a running special, a “wildcard” dish if you will. Almost every week, I make something sweet just on a whim. Sometimes there’s a purpose – a birthday, a party – sometimes it was a bad day, and sometimes I just have too many eggs on hand and I need to bake! This week, we had a lot of mini snickers bars after a weekend of rowing (on Sam’s part) in Boston. Instead of letting them sit there (and tempt me endlessly) I decided to figure out a way to use them in some sort of baked deliciousness. Luckily, the girls over at Big Girls, Small Kitchen were thinking similarly! Their peanut M&M blondies seemed like a perfect way to foist a few extra mini snickers on unsuspecting friends and colleagues. Feel free to add your favorite leftover Halloween candy to this batter. Preheat oven to 350°F. Butter and flour 9 x 13 inch metal baking pan. Whisk 1 cup flour, salt, and baking soda in medium bowl to blend. Melt ½ cup butter in heavy large saucepan over low heat. Remove from heat; add sugar and whisk until smooth. Cool mixture 2 minutes; whisk in eggs and vanilla. Using a spatula, stir in flour mixture, then the snickers bars. Spread batter in prepared pan. 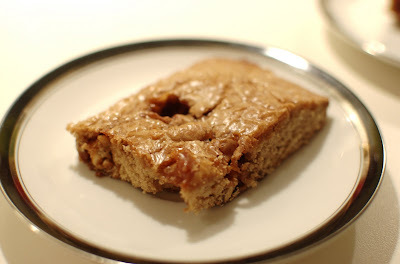 Bake blondies until golden, or a tester inserted into center comes out clean, and edges just begin to pull away from sides of pan, about 20 minutes; cool completely in pan on rack. Cut blondies into 18 bars. A great idea to extend this to all candy leftovers! Love that butter and sugar can be a vehicle for, um, more butter and sugar. Did the caramel in the Snickers get all melty and gooey? That sounds absolutely delcious. But you're right, the brown sugar is just the perfect compliment to candy.